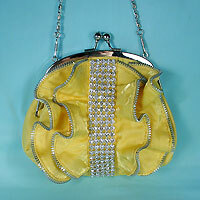 Satin evening bag purse with double row of crystal rhinestones across the flap. 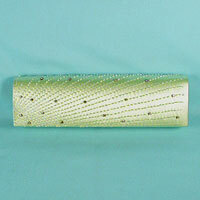 This beautiful jade green clutch bag is the perfect accessory for any range of green solid or print dresses. It has a full flap with cover the entire front of the purse and has a double row of crystal rhinestones running across the bottom about on half inch from the edge. Included are a matching shoulder cord, satin lining and snap closure. 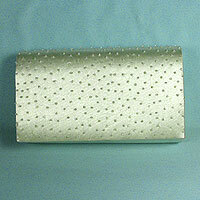 Long slim satin clutch bag with a beaded and rhinestone design. Includes a double snap closure and a matching shoulder cord. 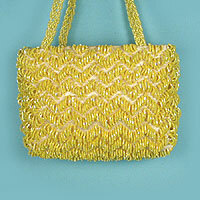 This lovely evening bag has a beaded starburst design which sprays from on corner across the length of the bag. It is lined in satin and has a 22 inch drop shoulder cord. 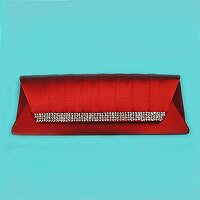 Its is a stunning evening clutch bag for any evening occasion. 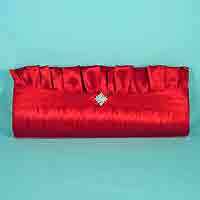 Measurements: width 11", height 3", depth 1½"
A long evening bag clutch purse with a stunning band of crystal rhinestones on the flap. The pleated flap is pointed in on the sides and has pleats that meat at the rhinestone band. It is lined in satin with a small pocket inside, has a matching shoulder cord and a magnetic closure. In red it would look festive at a holiday dance or dinner party and, of course, at a prom or wedding. 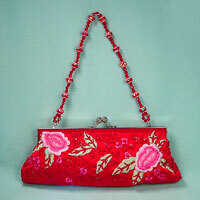 Measurements: width 11", height 3½", depth 1½"
Long satin clutch bag with beaded and embroidered design. This beautiful bag has flowers and leaves embroidered at opposite ends on both front and back and the body of the purses is done in a beaded stem and leaf design. It is lined in satin with a side pocket. It has a metal frame with a kissing ball clasp closure and includes a beautiful retractable beaded handle with a seven inch drop and a 22-inch drop chain. 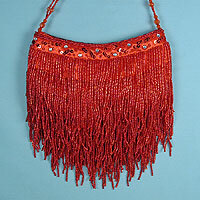 Measurements: width 1½", height 4½", depth 1½"
Beaded evening bag with layers of shimmery beaded fringe on a satin purse. The top rim is curved has added sequins and rhinestones for trim. This lovely bag is lined in satin with a small side pocket. It includes a 13 inch beaded handle and a snap closure. 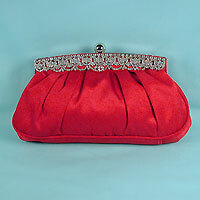 This is a great evening purse for proms and special occasions. 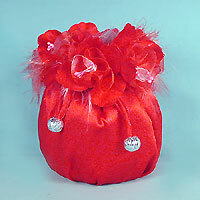 Measurements: width 7", height 4½", depth 1"
Beautiful satin drawstring bag with flowers and feathers. Include a matching satin soft handle. Closes with drawstrings ending in diamond cut silver balls. 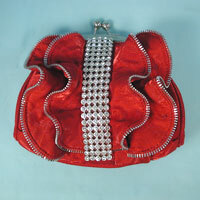 Stunning pleated satin purse with wide crystal rhinestone adorned frame. The rhinestones are arranged in a scalloped flower lace design. 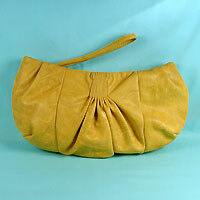 This roomy evening bag is gathered at the top with pleats. It has a metal frame, ball clasp and includes a shoulder chain. 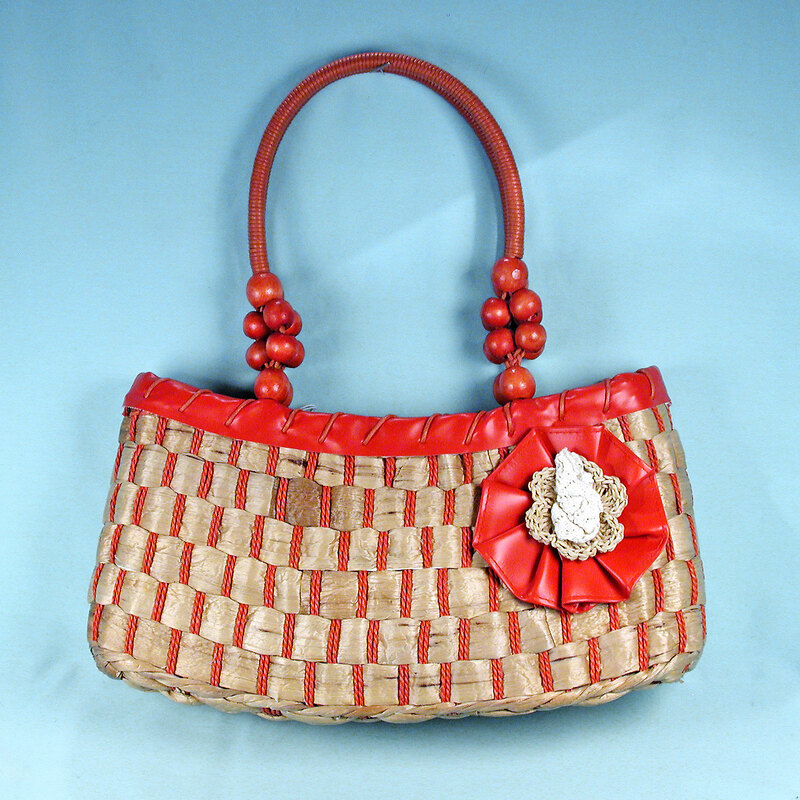 Measurements: width 10", height 5", depth 2½"
Large straw bag with colored trim, straps and decoration. Measurements: width 15", height 7", depth 3½"
Faux snake evening bag or clutch bag with crystal rhinestone clasp. This small purse has great style for both formal and informal evening outings It has a silver tone metal frame and sides with a crystal rhinestone push clasp and a retractable hand chain with a 7-1/2 inch drop. The oblong shape has curved dip in the center where the clasp is located. 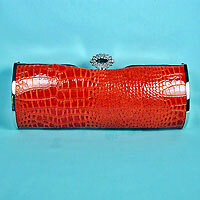 This clutch purse is deep red in color and fully lined. Although it is not large enough to accommodate a cell phone, it will hold many personal items. 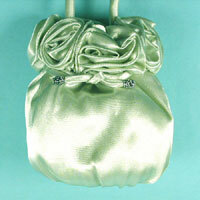 Measurements: width 8½", height 4-3/4", depth 2½"
Satin or lam� ruffled evening bag in vivid colors. This beautiful evening clutch is fashioned with vertical pleats at the bottom, a horizontal band in the middle gathered in the center and secured with a rhinestone princess cut diamond shape ornament,and a row of ruffles at the top. It is lined with a pocket on the side, has a snap closure and includes a matching handle chain. This lovely evening purse which adds an alluring feminine touch to any ensemble. Measurements: width 10", height 4", depth 1-1/4"
This beautiful cloisonne pen is slim and comfortable in the hand and looks stunning when you fetch it from your evening bag. Measurements: width 1/4", height 5-1/4"